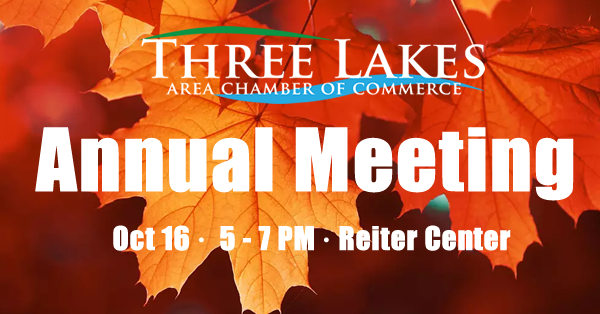 Join us for the 2018 Annual Meeting of the Three Lakes Area Chamber of Commerce on Tuesday, October 16 from 5 – 7 PM at the Reiter Center. Appetizers and beverages will be served as we welcome in the new 2018-2020 members of the Board of Directors and thank those who have and continue to serve. This meeting is open members and to anyone who wishes to learn more about the Chamber of Commerce in Three Lakes. Let us know if you plan to attend so that we can have an accurate head count and plan accordingly. Also, Midwest Selfies will be present with their selfie station offering free head shots and group photos! If you are currently a member in good standing and have not received a ballot, please contact the chamber office at 715-546-3344 or stop in. Ballots must be returned to the office by 5 PM on Monday, October 15th. We look forward to seeing you at the Annual Meeting and celebrating the accomplishments of 2018 and looking ahead at 2019.